Follow the development of GDC in the Pilot Project Blog. Major objective of the Green Design Centre (GDC) is to become an educative public information centre in south east Europe, showcasing new concepts and technical solutions for the realization of dynamic and green building concepts, supporting circular use of materials and energy within the built environment. Green Design Centre is envisioned as a location that will be showcasing principles of circular buildings. It is also a place for development of new reversible concepts with the local industry. GDC is open to the public and has educational purposes. As such, it will be a part of a new innovation park in Mostar, where different aspects of sustainable living will be integrated such as urban faming, wind mills, open workplaces for disabled children and open expo exhibiting innovation sustainable concepts. Green Design Centre will be developed as a multipurpose and demountable/replaceable structure demonstrating waste reduction of 60% and the reduction of the use of virgin materials by 50%. The centre is designed with the capacity to illustrate functional change from exhibition, workshop space to office concepts. The experiments will showcase reversible building design approach and its materialization through development of integrated architectural spatial and technical solutions that support reversibility of the building without waste generation. 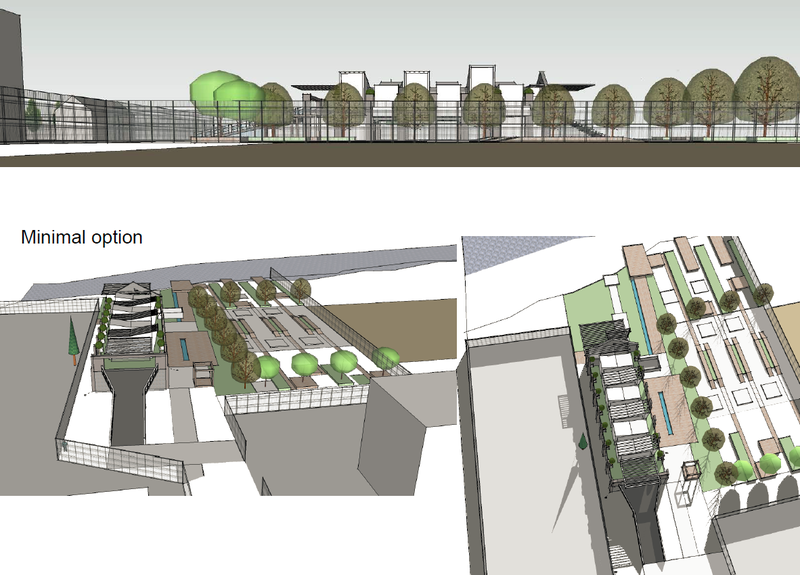 The Green Design Centre will be a new construction of 100 m² replacing an existing structure. The impact of revisable building approaches as design for transformation, disassembly and reuse will be measured at the end of the project. The impact will be measured based on the materials reuse and consequently waste reduction indicators being developed within the project. Comparisons will be made between the waste production and material reduction related to conventional building and waste production and the reduction of the use of virgin materials as a result of the construction of the GDC. GDC will be developed through transformation stages. 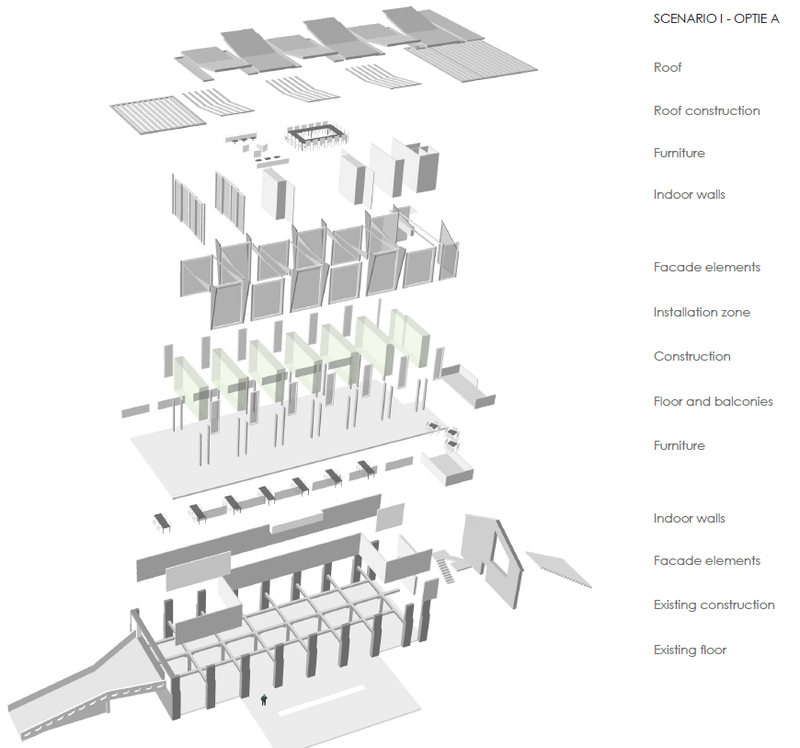 The scenarios are developed with the aim to set up the base of GDC that will be transformable and multifunctional. 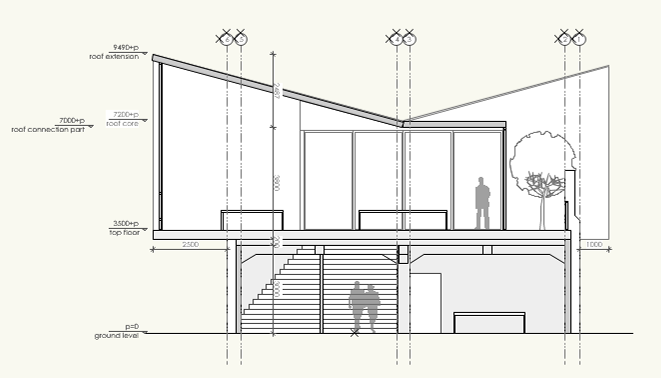 The core will be able to adjust its space to exhibition, lecture room or workshop space. The first construction phase has focus on partial demolition of the existing structure and as a follow up a construction of the core of GDC that includes raised floor with steel grid that will take care of flexible integration and adjustability of installation service. Vertical portals on the first floor will provide vertical distribution of installation services and function as the loadbearing part of the core of the first floor. The first scenario will have 180 m² of exhibition/office space on the first floor including terrace /garden on the first floor. All structural elements in the middle of the first floor will be removed as well as façade filling between the columns. 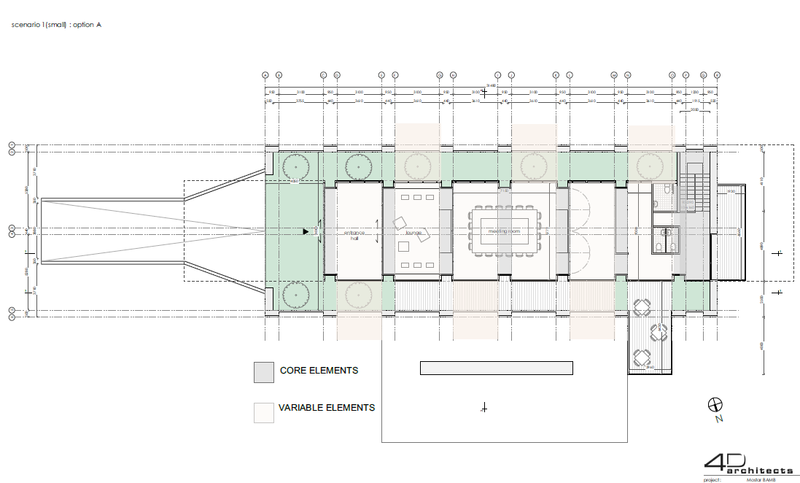 A raised floor will be placed on the first floor made of steel beam ( see figure bellow) to provide space for the distribution of installations, space for green gardens on the first floor and connection points for the transformation of the first floor during the second scenario by adding units. In the first place ground floor will be cleaned and structure restore. It will be used as a workplace primarily in spring, summer and autumn. The main public functions are placed on the first floor which is easy accessible by the ramp originally used for transport of goods to the first floor. In the second scenario, Modules forming GDC will be extended including angled south modules that will be cowered by PV panes and North modules covered by green. Primarily exhibition space will be rearranged into meeting/office spaces as well. Ground floor will be organized as a workshop space connected with the outside terrace for outside work in summer. First extensions are units with roof oriented to south for energy production. Each extension unit has 14m² and provides additional space for individual office space or meeting rooms. The intention is to start second transformation at the end of 2018.